Football fever has taken over at SkillOnNet with the innovative casino software provider launching a special summer soccer promotion across its network of brands, which include PlayOJO, DrueckGlueck and LuckyNiki. SkillOnNet will be giving away a brand new Mini Cooper car every week from 14th June – 15th July, as well as a raft of other prizes. 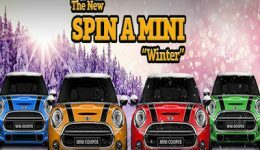 The Spin-A-Mini slots tournament promotion will be available on all brands powered by SkillOnNet casino software, including its casino white labels, so online casinos such as SlotsMagic, MegaCasino, PlayMillion, QueenVegas, Casinoandfreinds, LuckyLouis and newly launched sensation Ahtigames.com will be participating. The promotion will be offered on a different slot title each week. The eligible games will be Foxin Wins Football Fever (14th June) the perfect football slot from NYX, Vikings Go to Hell (21st June) everyone’s favourite slot from Yggdrasil, Play’n GO’s hit slot Legacy of Egypt (28th June) and Ninja Master (5th July) from GVG. To take part, players simply play 100 spins on the eligible slot game for that week and then they will receive a Free Daily Casino Tournament Ticket. They then select the Spin a Mini Free Ticket option to claim their Tournament Free Spins. 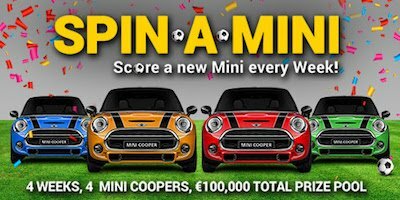 Wins from Tournament Free Spins are logged on a leaderboard, and come the end of the week the player with the most points wins a brand new Mini Cooper car. Players also have the option to purchase extra tickets for €1. Michael Golembo from SkillOnNet, said: “Football fever will be taking over the world this summer, and we wanted to celebrate with a special give-away for all of our players across our network of brands. “It’s a unique casino promotion over four weeks with four Mini Coopers to win, plus lots of other prizes like once-in-a-lifetime trips to dream destinations! And thanks to all our slot provider partners for helping us to make Spin-a-Mini special for our players. Wagering terms and conditions apply. All details above were correct when published on June 5, 2018.